I grew up in a coal town in Nova Scotia. Growing up, teachers told us about the strikes in the 20's, the starvation, the hardship. I don't think us kids really understood. We just wanted to know was it recess yet? Those were the old people's stories. It had nothing to do with us at the time. Seeing it all laid out in black and white in Coal Black Heart by John DeMont, I felt very strange. I knew about it but reading it was different. DeMont's obsession with the coal industry starts with the Westray disaster in 1992. He was a reporter for Macleans Magazine sent to cover the story. Having family roots in mining but no direct contact with coal himself, the stories he heard peaked his curiosity. He began what would become years of research for this book, tracing the history of coal in Nova Scotia. DeMont starts at the beginning, when Nova Scotia was covered in tropical forest, moves through the arrival of the Europeans, the glory days of coal, and it's demise in the province. Coal mining is a dirty and dangerous job, even today, but a few hundred years ago it was a death sentence. In England, men, women and children maimed themselves to pull it from underground. When the opportunity to better their lives in Canada came, people from all over moved to Nova Scotia. They found that things weren't much better. 'The Company' practically owned the miners, renting them shacks and requiring them to buy only from The Company stores. Since the miners had no choice but to buy their goods from the store, gauging was the norm and miners found that they owed The Company more than they made. God forbid a man get sick and be unable to work! In the 1920's, the miners could take no more and thousands of workers refused to go underground. They were threatened and beaten, even the government sent troops to force them back to work. They stuck to it for months while the arrogant mine owners bragged that they would starve them back to the mines. Finally, the workers won and as time went on conditions in the mine and at home improved. When I was a kid, just about everyone I knew had a Dad or an Uncle or a Grandfather in 'The Pit'. Coal was king. Then it fell to pieces with the drop in coal prices. The mines closed and the coal towns shrunk. DeMont manages to mix historical fact with his own family history which adds personality to the grimness of the book. He mixes in little asides about the characters who worked in the mines and how they lived and shaped the towns that grew around the mines. It's quite a thorough history as well, and helps explain to the world why Nova Scotia (in particular Cape Breton) is the way it is- the good, the bad and the ugly. It is often dark but he manages to end the book on a hopeful note. Recommended to anyone with an interest in history, especially Canadian. Thanks to Random House for the copy. This sound quite compelling! I added it to my TBR. I saw an outstanding documentry about Westray a few years ago at the Vancouver International Film Festival. I think CBC may have aired it too. This sounds really good. Rocket Boys touches on how the mining companies treated their employees in West Virginia. as a young boy, my grandfather was sent to work in the coal mines of western PA. he didn't talk much about it, but i got the sense that it was a terrible experience. 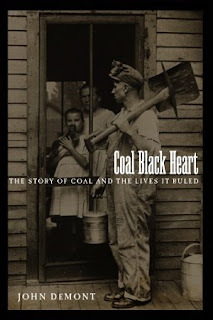 i'm interested in reading this book if only to see what life was like for coal miners. thanks for the review! This goes on the wishlist. Thank you!!! This sounds really fascinating. Great review. This sounds like something both my husband and I would like. Thanks for the great review. Teddy- I do hope you read it. Bermuda- I'll have to look that one up. Booklineandsinker- My Grandfather worked in the mine for years. I think there were times when it was quite scary. Kailana- I think it's your kind of book since you like NS history. Beth- I hope you both check it out. I'm glad this was a good book, I enjoyed Demonts other book about NS "The Last Best Place" - he's such a great writer. Coal mining history was barely touched on when I was going through school, but a few years ago we did the mine tour in CB and I've been fascinated ever since.